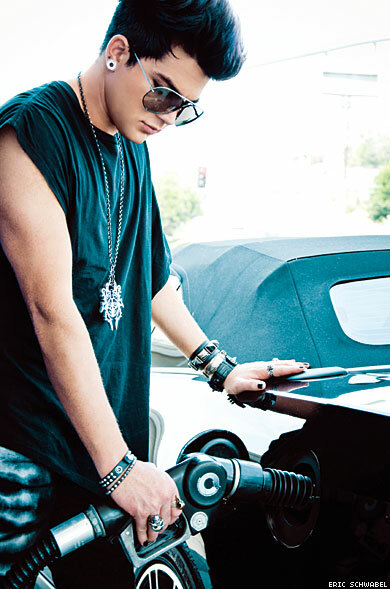 Adam Lambert’s mornings aren’t so unlike those of many Los Angeles residents on their way to work. Normal to a point. Then there’s the whole magazine interview, photo shoot, and a day working in the studio. Lambert is recording his follow-up album to his 2009 debut, For Your Entertainment, and has been writing and recording for the last five months. And a lot has changed since the most controversial figure to come out of American Idol first took to the national stage. At age 12 he wowed the audience of his San Diego children’s theater company with a powerful operatic solo in Fiddler on the Roof, an experience that launched a budding theater career. Fifteen years later his unexpected reboots of some beloved songs (Johnny Cash’s “Ring of Fire,” Tears for Fears’s “Mad World”), paired with a more decidedly glam aesthetic than that of his largely all-American competitors, made him the most interesting thing to watch on American Idol’s eighth season, where he finished as first runner-up. Lambert has long been comfortable in front of an audience. It was the other trappings of fame that threw him — and the media — for a loop. He came out in Rolling Stone and appeared in a provocative photo spread in Details magazine suggestively grabbing a naked woman. When he did agree to appear in a gay publication, in Out magazine (owned by Here Media, the parent company of The Advocate), his management issued so many conditions for the photo (“must accompany a straight woman”) and interview (“not too gay”) that Aaron Hicklin detailed the conditions in his editor’s letter. Lambert responded via Twitter, suggesting that others not force their own agenda on him, and then shocked media watchers on his first post-Idol TV performance by kissing his male keyboard player at the American Music Awards. A generally more speculative matter is the content and release date of his new album, which, as of press time, is untitled and tentatively scheduled for a November release. Lambert describes a more personal album, driven by vocal singer-songwriter tracks, electrofunk, and synth-pop in a “Nine Inch Nails meets George Michael” sort of way. “I know that’s a weird mash-up, but that’s what it feels like,” he says. Though he’s tight-lipped about the nature of his relationship with boyfriend Sauli Koskinen, the 2007 winner of Finland’s Big Brother, he will say they met in a Helsinki bar last year after one of Lambert’s shows. Without knowing he was a TV personality, Lambert approached Koskinen to say hello, and they’ve been dating since last November. But he’s taking it all with a grain of salt.